Has your once beautiful and luxurious Corian® countertop in Chandler been worn down to reflect the wear and tear of everyday use? At AZ Countertop Repair & Refinishing, repairing your Corian® countertop in Chandler is one of many services we provide. We also refinish your countertop, as well as replacing your sink, bringing life back into your kitchen with ease and expertise. At AZ Countertop Repair & Refinishing, we pride ourselves in providing the highest quality customer service. With over 30 years of experience and five star reviews on both Google and Yelp, making sure that you can enjoy your Corian® countertop in Chandler is our number one priority. For the best Corian® countertop repair in Chandler, come to AZ Countertop. Corian® is a special solid surface material that has a beautiful yet durable finish. Because Corian® countertops are solid surface, they don’t absorb stains the way some countertops can and they are more resistant to surface damage. However, because they are solid surface, they also require a special touch to repair them. Otherwise, the color and texture will be off, and the repair will stand out more than the damage did. The professionals at AZ Countertop Repair & Refinishing have 30 years of experience working on Corian® countertops, and they can achieve the seamless results you need for your Chandler home. Whether you have surface scratching, gouges or more serious damages to your Corian® countertops, we have a solution to repair and restore them. In fact, we’ll do such a good job on the repair that you won’t be able to tell where the damage ever was. Replacing your countertops can be an expensive and time-consuming undertaking. We can repair your countertops in less time and for far less money, helping you to preserve the value of your home and your quality of life in it. You’ll love coming home to your new countertops. In addition to our commitment to providing the highest level of workmanship in repairing your Corian® countertops in Chandler, we are also dedicated to providing the best customer service in the area. Our friendly professionals will show up on time and will courteously answer any questions you have about the work and walk you through the process. You’ll know that your home is in good hands when you work with our team. When your Corian® Countertop needs the best refinishing services, come to AZ Countertop, where we pride ourselves in our Corian® refinishing and repair work! We can never avoid damaging our Corian® countertops, so for excellent Corian® crack and scratch repairs, come to AZ Countertop! When your sink in Chandler needs to be replaced and a new one must be installed, get the best sink replacement and installation from AZ Countertop. 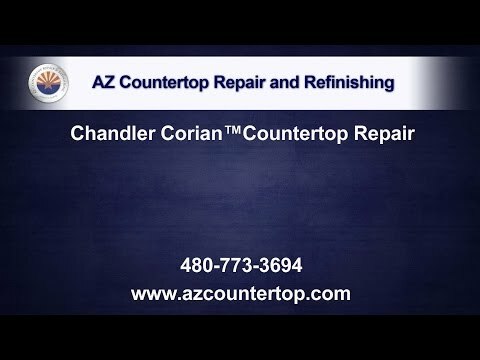 Call AZ Countertop Repair & Refinishing today to talk about your Corian® repair needs in Chandler. We’re ready to show you why we have earned our reputation as the best Corian® repair professionals in the area. We are committed to providing the highest level of workmanship in repairing your Corian® countertops!